Consolidating ~95% of the Tennant Creek Mineral Field's prospective Warramunga formation rocks. The Tennant Creek Mineral Field is situated approximately 500km North of Alice Springs on the Stuart Highway, the main road link between Adelaide and Darwin. Important infrastructure running through Tennant Creek includes the Adelaide-Darwin railway and gas pipeline. Tennant Creek has a population of approximately 3,500 and is the main service Centre of the Barkly Tablelands region. The Paleoproterozoic Tennant Creek Block comprises of a poly-deformed flysch sequence (Warramunga Formation) intruded by syn-orogenic granite and granodiorite as well as stratabound felsic porphyries. A group of silicic volcanics and volcanoclastics (Flynn Subgroup) were deposited, but not deformed, during the Barramundi Orogeny, then subsequently deformed and intruded by anorogenic silicic intrusives and lamprophyres. The gold-copper-bismuth mineralisation of the TCMF is predominantly hosted in magnetite-chlorite-hematite ironstones or sheared variants. The ironstones and mineralisation are localised in EW to WNW trending structures that have historically been referred to as "lines of lode". These ironstones and mineralisation are discordant to the folded Warramunga Formation rocks and tend to be located in structural flexures, near the hinge zones of the fold axes. Mineralisation occurs in small-to-medium sized lenses within sheared ironstone. Based on historical data, some of the historic deposits averaged life of mine grades of 15-20g/t gold and 2-4% copper. Examples include the classic Juno and Nobles Knob deposits with grades in excess of 50-60g/t gold. The sulphide content of these primary deposits rarely exceeds 10% and common ore minerals include chalcopyrite, native gold, cobaltite and bismuthinite. The gold-dominant oxide and primary ores are generally free-milling, which can result in high recoveries (up to 98%) being achieved. Oxidation extends up to 120 metres below the surface and, within the ironstones, results in a hematite-goethite-quartz-clay assemblage. The copper mineralisation is typically leached and depleted while the gold mineralisation can be spectacularly upgraded. The key to reinvigorating exploration in the Tennant Creek Mineral Field (TCMF) is the application of new concepts and new technologies. It can be seen in the following chart that discovery (and subsequent production) of new deposits is strongly tied to the application of new concepts and technology. Historically this was the application of magnetic geophysics – bonanza discovery and production rates closely followed the BMR aeromagnetic survey in 1955, then further discoveries followed on from the more detailed AGSO survey in 1987. 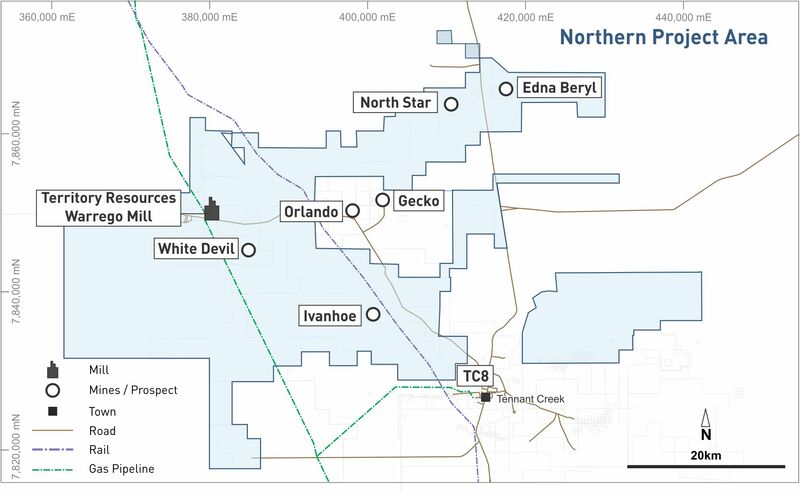 Emmerson is the first company since 2007 to apply new proprietary exploration techniques and concepts, after consolidating a dominant 2,600 km² tenement package. 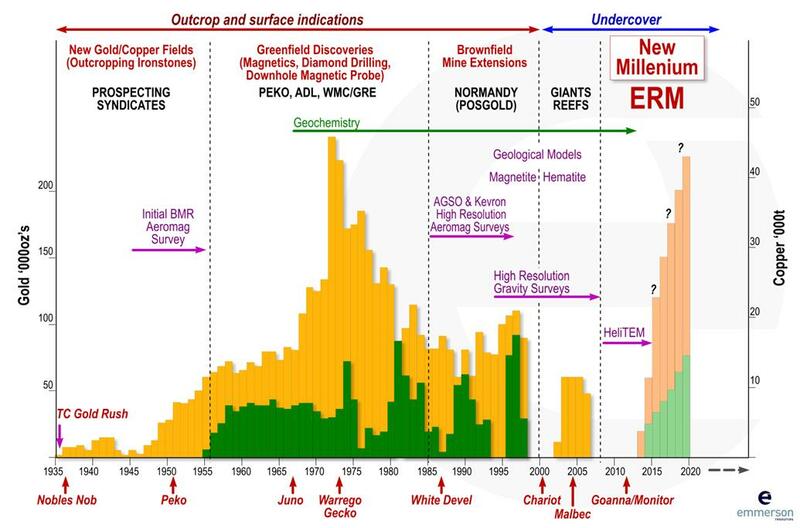 Emmerson believes that the decline in discovery rates as suggested in the chart, does not reflect metal depletion but rather is a direct consequence of the lack of fresh concepts and technologies. To date Emmerson has discovered high grade gold at Edna Beryl and Mauretania, and high-grade copper and gold at Goanna-Monitor. These are the first discoveries in this province for over a decade and testament to the application of new concepts and technologies. The defining characteristics of this new generation of discoveries includes their association with hematite ironstones, that were largely “blind” to previous historical exploration. The tenement package is geographically divided into the Northern (NPA) and Southern Project Area (SPA). The Northern Project Area (NPA) is 100% owned by Emmerson and includes the Jasper Hills (Au, Cu, Co) project, the currently operating Edna Beryl Mine and Emmerson's recent high-grade gold discovery at Mauretania. The NPA covers ~1,900km² or ~73% of Emmerson's TCMF tenement package. The Edna Beryl Mine is currently being mined under a Tribute Agreement between Emmerson and the Edna Beryl Mining Company (EBMC) (now owned by Territory). Emmerson retains 100% ownership of the mineral lease and receives 12% of all gold produced. The Warrego Mill located in the NPA is now 100% owned by Territory, with Emmerson retaining a priority processing position on a cost+ basis. 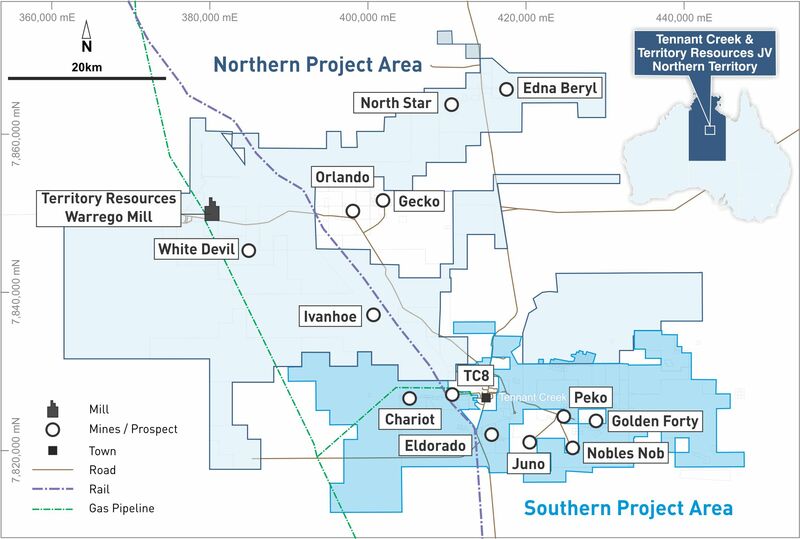 The Southern Project Area (SPA) is covered by an Exploration Earn-In and Joint Venture (EEJV) between Emmerson and Territory Resources. Where $5M in exploration will be spent over 5 years fully funded by Territory Resources and where Emmerson are the operators and managers. 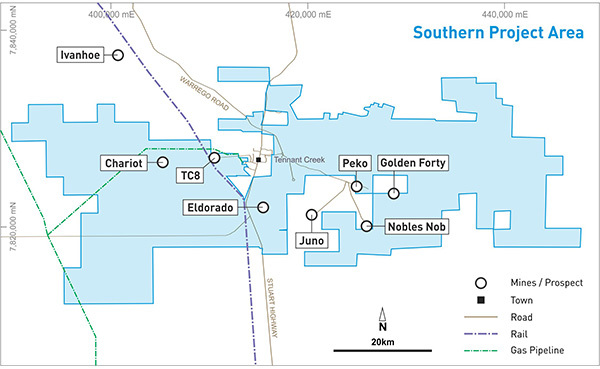 The JV area covers ~710km² or ~27% of Emmerson's TCMF tenement package. Also, within the SPA are the tenements subject to the Small Mines Joint Venture (SMJV) also between Emmerson and Territory. The JV operates on a 75/25 profit share basis (except for the Chariot Mine where Emmerson will receive 6% of all gold produced). Territory are the operators and managers of the SMJV.